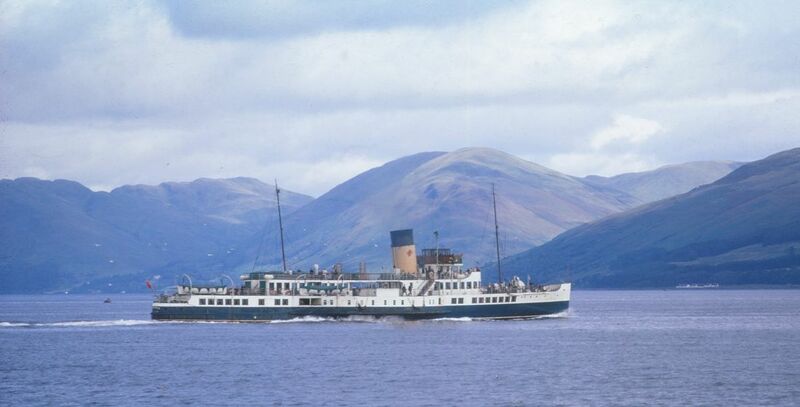 Served on a wide variety of routes, primarily ferry sailings, but also cruising out of Ayr. Converted to oil-burning for the 1955 season. Radar fitted in 1959. 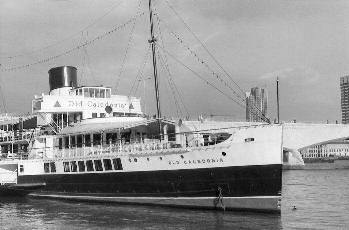 Caledonia's appearance in 1934 along with her near-sister Mercury caused considerable interest and, amongst paddler purists, considerable dismay on acount of her unusual, but thoroughly modern appearance. Whilst the LNER's new Jeanie Deans of 1931 looked not dissimilar to existing paddlers, Caledonia featured a large elliptical funnel, deck shelters fore and aft connected to provide an extensive promenade deck, and most revolutionary, paddleboxes, which when seen broadside on from a distance, appeared to conceal her true propulsion method. It had been 31 years since the last Caledonian paddler had entered service, and although they had not added any turbine steamers to their first such vessel (Duchess of Argyll of 1906) until 1930, continued adherence to paddle propulsion was mystifying, especially when it appeared that every effort had been made to make the vessels look like turbine steamers. 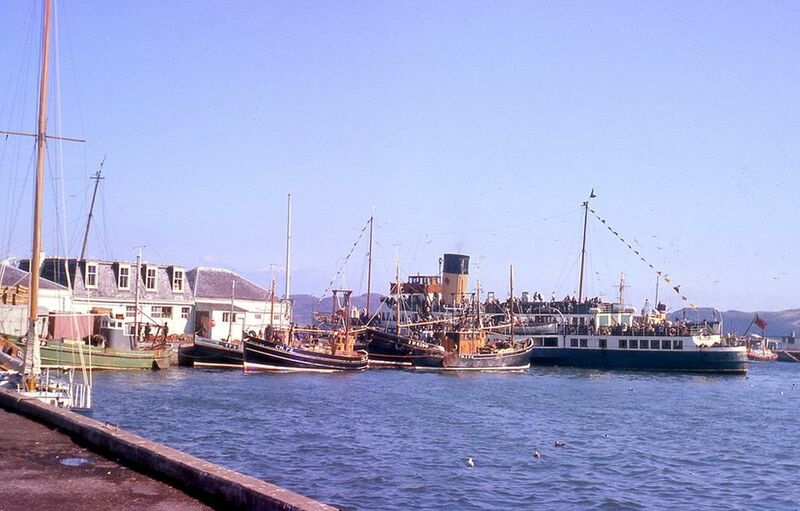 Caledonia was not designed for the long hauls to Campbeltown and Inveraray - railway connections to Dunoon and Rothesay would be the staple, and sufficient deck space for the carriage of barrows and small cargoes would be needed. 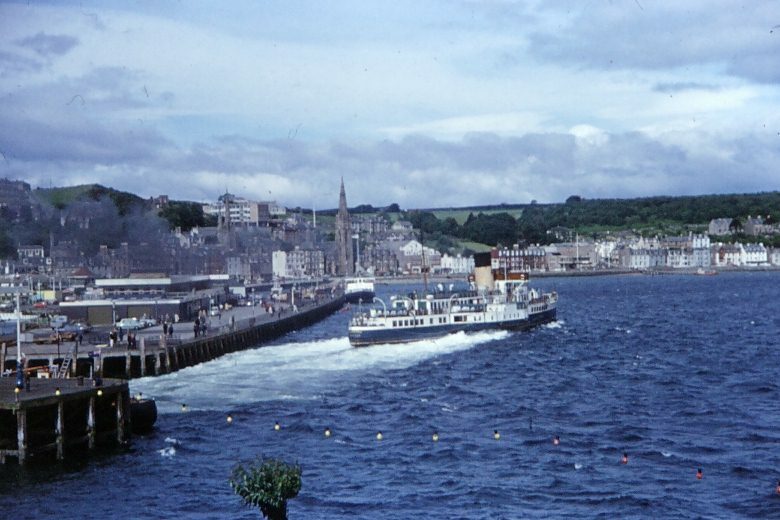 As it happened, the early 1950s saw car ferries introduced to provide an increasingly necessary service on the main routes across the Firth. Paddlers were increasingly relegated to relief duties, but this remained a vital role due to the poor capacity and turnaround times of the car ferries in peak periods. Her excellent covered accommodation, plus a reasonable turn of speed (over 17 knots on trial and 14 knots in service), made her an ideal cruise ship and even in pre-war days she was employed cruising to Arran via the Kyles. 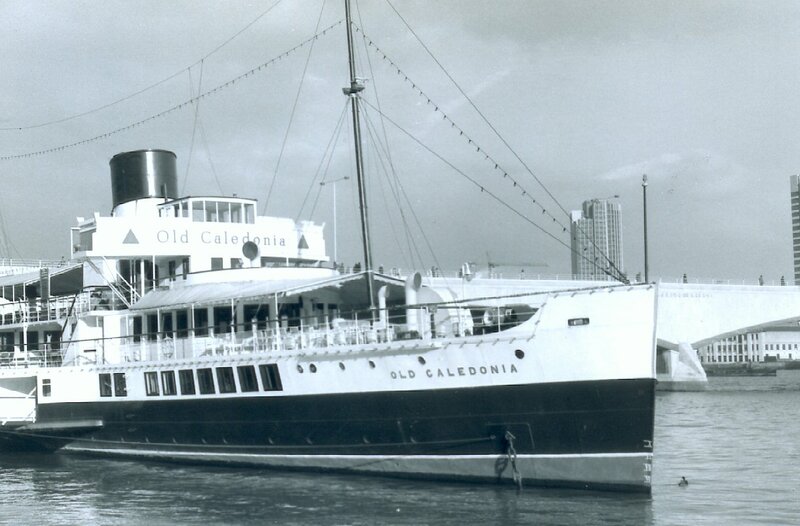 The car ferry revolution meant that Caledonia was posted to Ayr in 1954 as excursion steamer for this popular holiday resort, which also entailed periodic relief sailings from Ardrossan to Arran. In 1965 she moved up-Firth to Craigendoran, to replace the withdrawn Jeanie Deans, cruising round Bute out of the former LNER stronghold for a further 5 years until the disastrous economics of Clyde cruising signalled the end. Above : Caledonia as HMS Goatfell - a minsweeper during World War II in which she was to witness the demise of her sister ship Mercury under her tow off Ireland. At the beginning of October, Caledonia made a few runs to Tarbet with the mails, a service which the CSP took over from MacBraynes on October 1st. 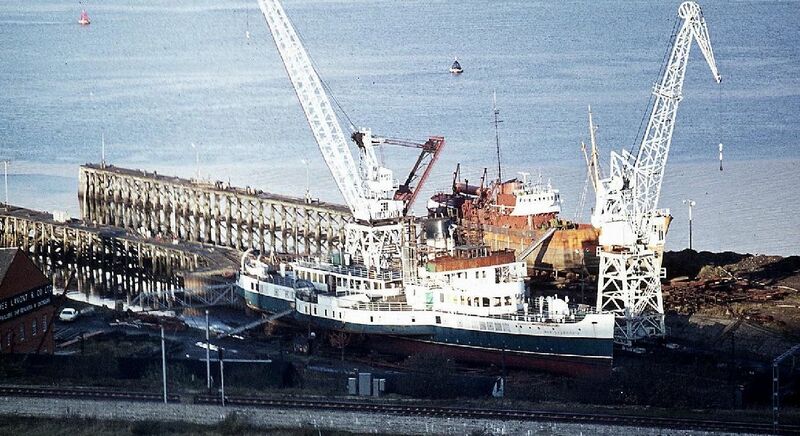 These were the last runs she made for the CSP before being sold for scrapping - whilst local enthusiasts and, to be fair, her new owners deserately sought a buyer who would find a new use for the old ship. 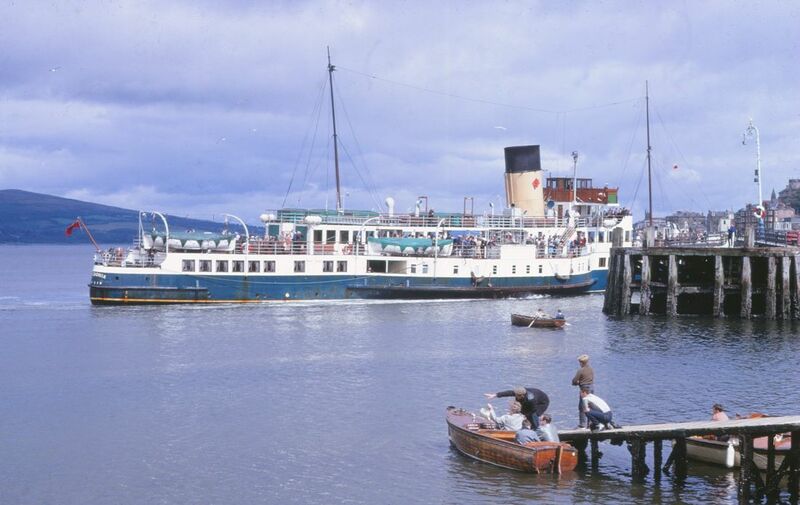 Brodick 1969 : The webmaster, having disembarked from PS Caledonia, watches the paddler steam out of Brodick Bay after what looked to be and turned out to be the last trip aboard as the favourite paddler was withdrawn at the end of the season. 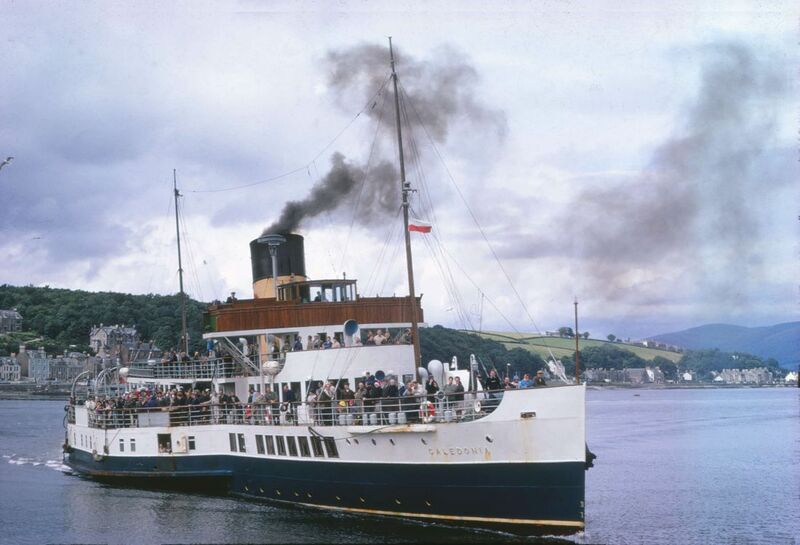 PS Caledonia and her very near-sister Mercury caused eyebrows to be raised when they appeared on the Clyde in 1934. 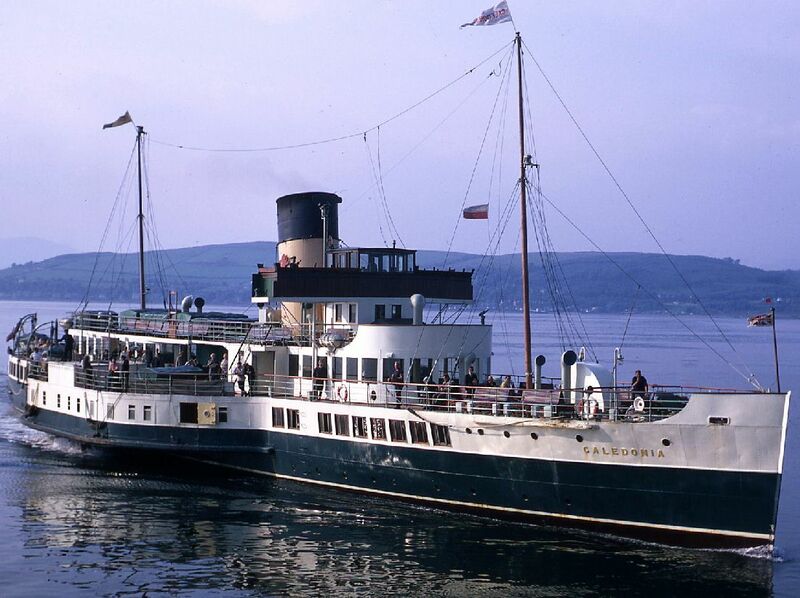 Perhaps it was a bit of a surprise that the Caledonian Steam Packet Company (CSP), who had in recent years introduced a couple of highly successful turbine steamers and had not had built a paddle steamer for 30 years, placed such vessels on their upper-Clyde ferry services. The CSP had always been near the forefront of technological innovation, but their choice of ship type was extremely conservative bearing in mind that elsewhere in Europe, motor ships were now the vessels of choice. The CSP clearly did not trust motor power for their purpose - and perhaps they were right. Such ships were not tried and tested, although the David MacBrayne in the western isles had already begun the experiment which was to totally change their policy in that part of Scotland. Nevertheless, the CSP did order the most up-to-date paddle steam engines available - triple-expansion, three crank machinery which had hardly featured at all on the Clyde until their competitor the LNER railway had them fitted to their new flier, Jeanie Deans of 1931. Caledonia and Mercury's biggest immediate impact was, however, in their modern styling. 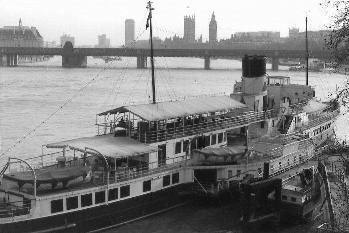 Considerable time had elapsed since the last Clyde paddle steamers had been built and new styles of architectural design were in vogue. The streamlined fore-saloon on the promenade deck reflected the most up-to-date ideas, but the paddle boxes, enclosed in vent-less sponsons created the most surprise - and controversy. From a distance, at least in profile, the two new ships almost appeared as if they were screw ships. 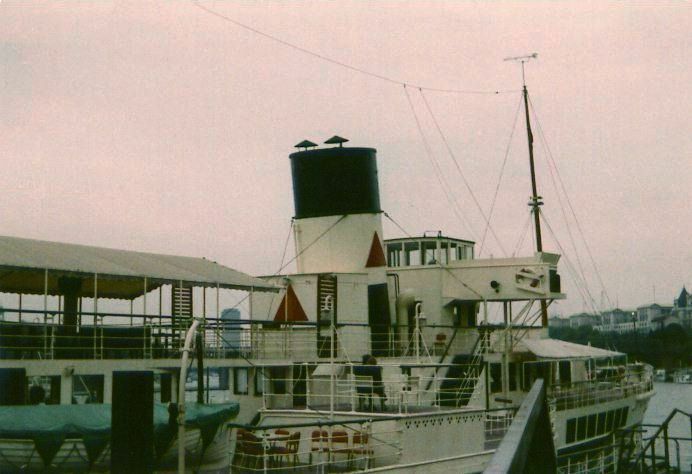 To cap it all, one large elliptical funnel gave a much more modern appearance than the tall thin funnels of earlier ships, including even the Jeanie Deans as first built.Were the CSP deliberately trying to hide the fact as well as possible that their new ships were in reality just old-fashioned ships in new clothes? Probably not, but irrespective of motives, the new paddlers brought a style - and quality of accommodation - to the fleet that far outstripped the older vessels. With spacious lounges on the promenade deck fore and aft, both with accessible observation decks above, each linked by alleyways above the open space on the promeade deck amidships she had considerably more space, both inside and out than her paddle predecessors. 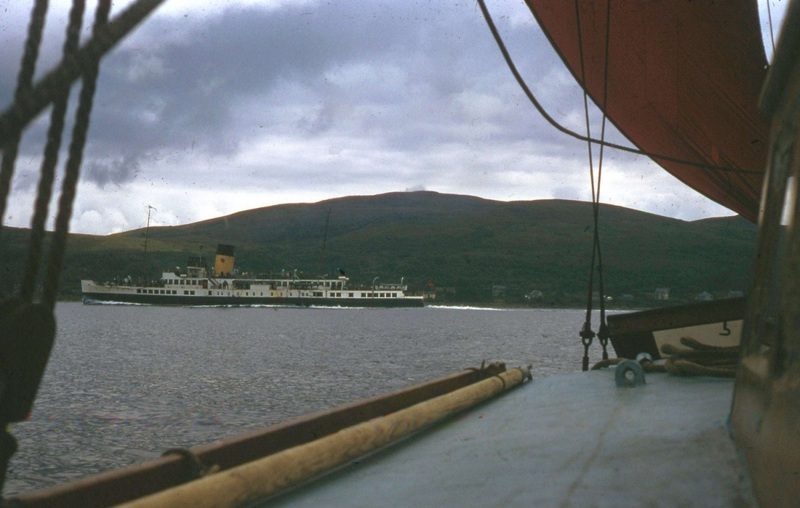 With the notable exceptions of three large paddlers built to replace losses in World War II and the ultra-conservative choice to build the Maid of the Loch for Loch Lomond from 1953, the 1930s saw the last new paddle steamers built for the ferry and excursion trade in the U.K. Caledonia was the template for that very final phase of paddle steamer development and in design terms perhaps remained the most "modern" of them all. 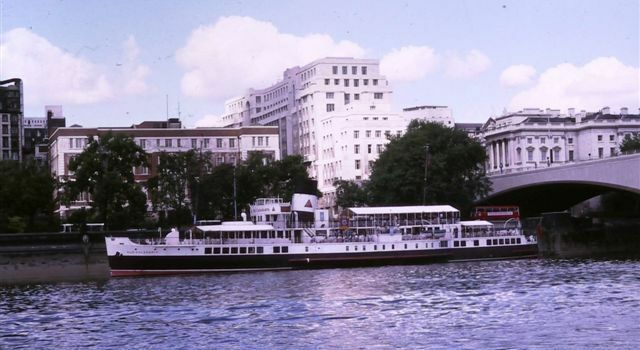 Unlike Mercury, which was lost during World War II less than seven years after her launch, Caledonia survived until the end of the 1969 season and saw further employment as a pub and restaurant ship moored in central London until so badly damaged by fire in 1980 that she was removed and scrapped. 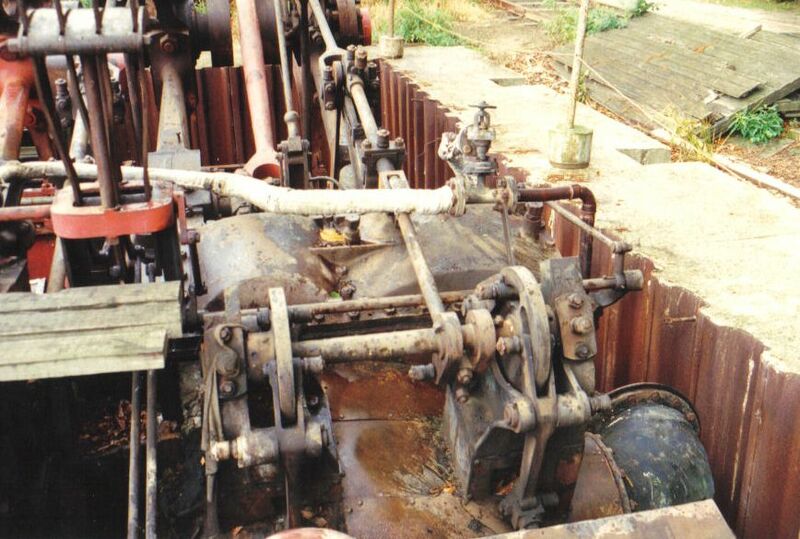 Her engines were recovered and are held in a museum collection.